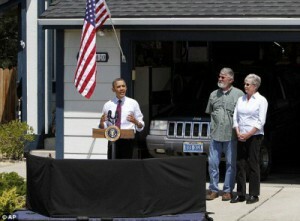 …in this election season (H/T: Hot Air) And I ask: when did Obama campaign well? No, seriously. Every successful campaign that Obama has participated in before 2008 was under the aegis of the Illinois Democratic political machine. He merely had to show up, hit his marks, speak a few times, vote as he was told, and let the targeted leaking of damaging information about his opponents do the rest. That doesn’t require political skill: that requires both the ability to conceal boredom, and excellent bladder control. Then, during the 2008 primary, Obama handed off the details of the primaries to the geeks* and vaguely went off to let them work on building his profile for a VP bid. The geeks then managed to hack the Democratic primary and munchkin the living hell out of it; they found every exploit that existed in the political source code, and used them all**. Again, Obama didn’t have to do a darn thing except show up. And as for the 2008 general election… well. McCain didn’t like to fight, the economy melted down, and Obama showed up. Barack Obama is an incredibly insecure man. Admittedly, he has reason to be. (Via AoSHQ) From Reno, NV… oh, isn’t this the cutest thing ever? #rsrh Barack Obama has lost Tina Brown. I think that Obama doesn’t like his job, actually. I think that he is genuinely of a professioral disposition in the sense that I think that he’s interested in chewing over the pros and cons, and he doesn’t like, he doesn’t like power and he doesn’t know how to exercise power. And I think knowing how to exercise power is absolutely crucial. He doesn’t understand how to underpin his ideas with the political gritty, granular business of getting it done. And that kind of gap has just widened and widened and widened. And so that every time there is a moment, a window where he can jump in, like something like a Simpson-Bowles as well, he just doesn’t do it. He hangs back at crucial moments when you have to dive through that window. …was fascinating, mostly because it represents a not-insignificant portion of the liberal establishment quietly washing their hands of the President. Mind you, it’s also nonsensical in one particular area: of course Barack Obama likes power. You don’t run for the job for two years unless you like power. What’s happened here is that Barack Obama is simply a complete incompetent when it comes to exercising power, mostly because he had absolutely no experience in it prior to 2009. No experience, no particular work ethic, and no external forces willing to give him negative feedback: is it a real surprise, then, that Barack Obama is a miserable failure as President?